Trailer winches let you pull your boat onto the trailer while it’s on an inclined launching ramp. Winches are mounted on a dedicated winch stand on the trailer tongue, on the support for the bow stop or on the trailer’s hitch ball using an adapter plate. A reel or spool holds 20–50 feet of cable, rope or webbing, and has a snap at the bitter end. With the snap clipped onto the bow eye of the boat, the winch operator can either crank the boat onto the trailer or allow the boat to slide backwards into the water at a controlled rate. 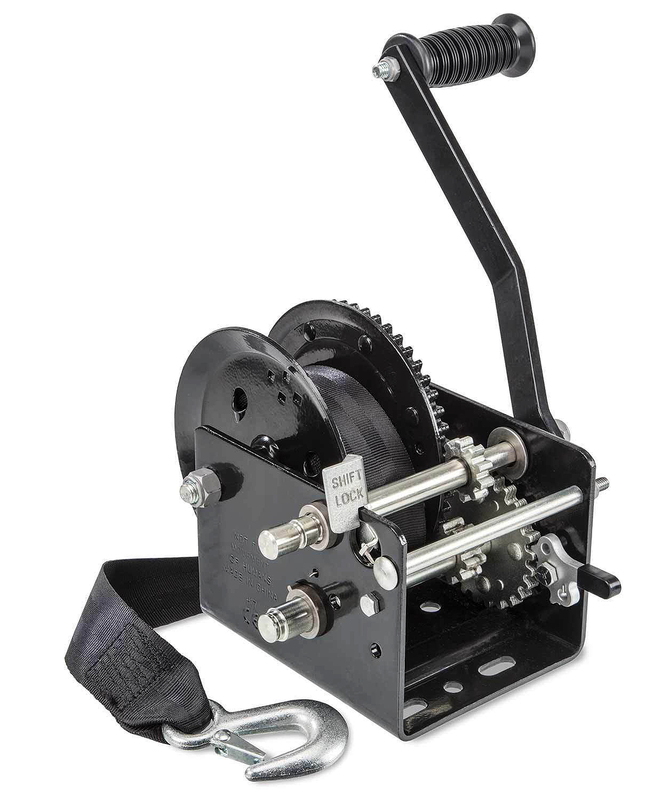 Hand-cranked manual winches multiply your strength, allowing you to pull a relatively heavy boat against gravity and friction. They also have a ratchet to hold the boat at any point on the trailer so it doesn’t slide back into the water, allowing a normal person to retrieve a boat weighing over a ton using a crank about a foot long and simple gearing. Larger models have a lower gear ratio to multiply your strength even more and two speeds for extra power. Electric winches use rugged DC motors, powered by the tow vehicle’s battery and electrical system. Using low-stretch steel cable to connect to the boat, some electric winches use a pulley or block at the boat’s bow eye to double the pulling power (which doubles the cable length and halves the retrieval speed). Pulling capacities range from 1,500lb. for smaller models to over 10,000lb. for the most powerful models. What Is Your Boat's Environment? Do you use your boat in a freshwater lake or in saltwater? Is the winch galvanized, zinc-plated, powder-coated or aluminum? Look at how many hours of saltwater exposure the winch is rated to survive. Winches are rated by their weight capacity, not by the length of the boat. Choose a trailer winch to fit the weight of your boat, motor and equipment. Heavier and longer boats require more powerful winches with longer cables. The general rule is to select a winch with a capacity rating of at least 3/4th the combined weight of your boat, motor, fuel and gear. This rule varies depending on a number of factors about your boat and where you launch it. Do you typically launch on steep ramps? Is your trailer equipped with carpeted wood bunks instead of rollers? If so, the load on the winch will be higher, and you should select a winch with capacity closer to the actual weight of the fully-equipped boat. Launching ramps that are gently sloped, or trailers equipped with rollers result in less resistance, so you can choose a smaller winch. However, since the difference in price between winch sizes is pretty minimal, you can choose a bigger winch for nearly the same cost. We also recommend Glyde Sliks, EZ Slides or similar anti-friction pads on your trailer’s bunks, which help your boat slide. Most trailers have a standard winch assembly bolt pattern, so upgrading to a stronger winch is easy if the current winch is inadequate. Do You Need a Single-speed or Two-speed Winch? How much cranking resistance is there when you pull your boat? For lighter boats like dinghies, inflatables and catamarans, a manual winch with a 3:1, 4:1 or 5:1 gear ratio may be all you need. For heavy-duty work we recommend two-speed winches. Fulton’s highest capacity model of their F2 Manual Winches gives you fast speed, with a 5:1 gear ratio for quick pull-in, and a second low speed, with 16.2:1 ratio, for increased mechanical advantage. A ratio of 5 to 1 means that you turn the handle five times to get the drum to rotate once. If the capacity of a two-speed manual winch isn’t enough for the weight of your boat, electric winches with variable speeds and high gear ratios (the Powerwinch RC30 is 450:1, for example) can move boats of up to five tons. Do You Need a Braking Solution to Assist in Managing the Load? 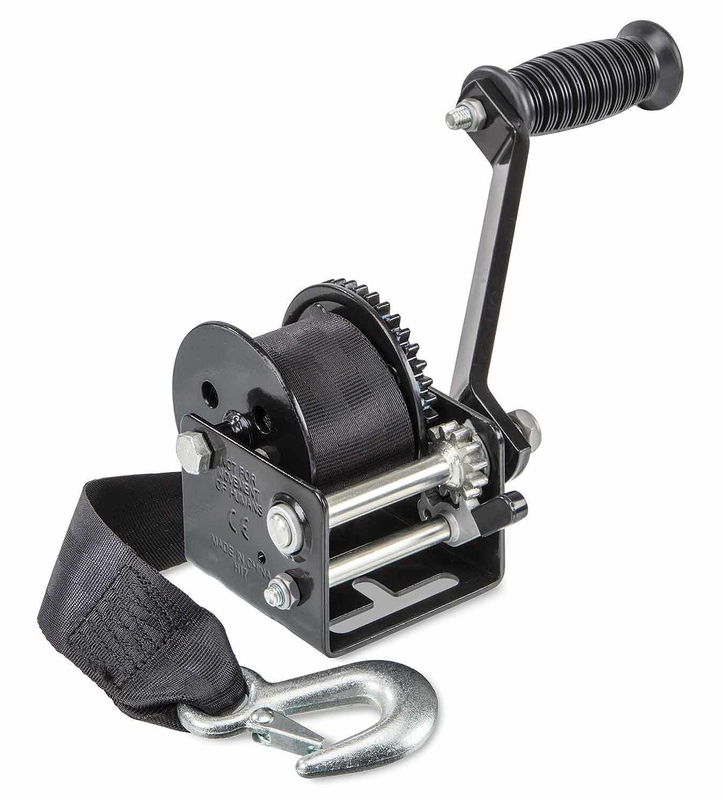 We like polyester winch straps like this one from Boat Buckle (rated for up to 5,500lb.) because it doesn’t scrape the bow of our boat or hurt our crew’s hands. If you have a large and heavy boat, you may need more control when launching, especially on a steep ramp. An electric winch with “power-out” is your option. Instead of free-spooling with gravity controlling your descent, a winch with this feature uses the motor in reverse for a more controlled launch. TRAC’s winches work this way. You can loosen the clutch to allow free-spooling, or power the boat out with the clutch tightened. 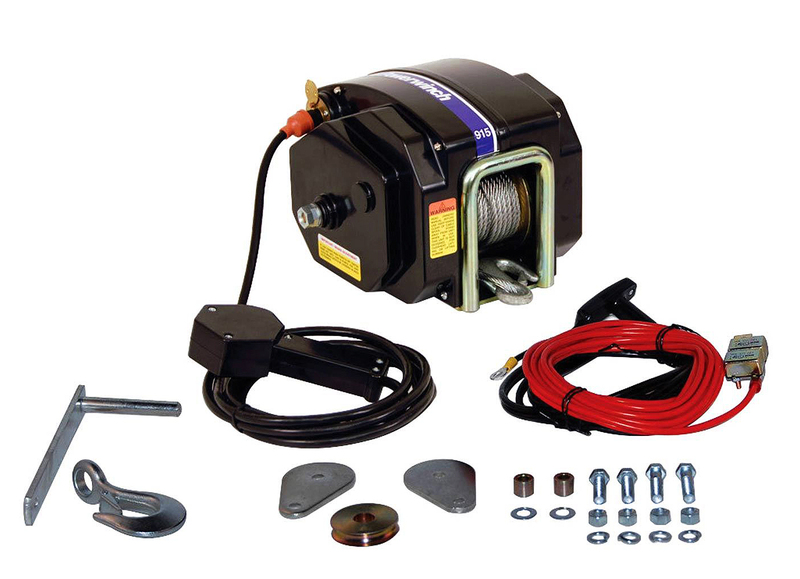 Powerwinch makes a Model 915 (part number 77915) with power in/power-out. Electric winches generally have a manual retrieve feature, a simple hand crank, in case of electrical or mechanical failure. Do You Want a Cable, Rope or Strap? Most electric winches use steel cable because they’re handling larger loads. Better cable winches use a level wind mechanism (similar to a fishing reel) to prevent cable snarls. Winches with cables also allow you to add a pulley block that will nearly double the weight capacity, and cut the speed of the boat’s travel in half. Smaller manual winches designed for lighter boats use polypropylene rope or nylon straps (the same material as used in the seatbelts in your car). Electric winches, like Powerwinch's 915 Electrical Trailer Winch seen here, include everything you need for installation. When installing the wiring harness, make sure it is attached to the towing vehicle’s frame every 18" with good wire ties. Keep wiring harnesses away from exhaust systems or moving parts like the vehicle’s suspension that could damage the wiring. Always use the circuit breakers supplied by the winch manufacturer and install them near the battery to protect the wire and the winch motor. Never use the vehicle lighting circuits to power an electric winch. These wires don’t have enough current-carrying capacity. Use the wiring harness and circuit breakers provided by the winch manufacturer and don’t use the trailer light power socket on your bumper. Trailer winches are not tiedowns. 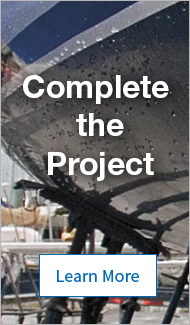 To prevent mishaps, use dedicated bow, gunwale and stern tiedowns to secure your boat on the trailer. For large boats add a safety chain to the bow eye. Make sure you have secure footing and proper leverage when using manual winches. Slips and falls by winch operators and injuries from winch handles that kick back are common boat ramp accidents. To avoid chafe on the winch line, be sure it doesn’t rub against any sharp edges on the winch stand or trailer. If frayed or worn spots appear, replace the winch line immediately with a new rope, strap or cable of the proper type, size and strength. Cable life can be extended by frequently lubricating it with wire rope lubricant so the strands of cable slide by each other with less friction. Lubricating your winch cable will also reduce the number of snags and frays in the cable. If you are using an electric winch, keep your tow vehicle’s engine running while you are winching to reduce the drain on your battery. We’ve heard too many stories about boaters not having enough juice left in their battery to start the truck after winching a heavy boat onto the trailer. Also, be sure your parking brake is set, and consider keeping someone at the wheel, in case the tow vehicle begins to slide down the ramp.